CETFA has been a critic of the use of carbon dioxide (CO₂) gas as a form of stunning and/or killing during slaughter since witnessing it in action at a slaughterhouse in 2009. Our friends and colleagues at L214 (France) have just released footage of the suffering pigs endure in these systems. 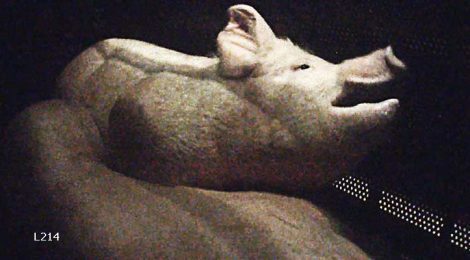 While gassing has been touted as a “more humane” killing method, L214’s footage shows it to be anything but — the pigs scream, frantically stretch their necks and gasp for breath for nearly a full minute while writhing in agony. Regulators in Europe are finally beginning to question the welfare of the practice, but both France and Canada continue to allow it. Please sign L214’s petition calling for a ban on the cruel practice.